Students of sustainability science are often faced with the need to consider a multitude of different knowledge types and forms. This can be quite challenging, given that many of these are generated in radically different ways. This, in turn, can be traced back to radically different understandings of reality and ways to study this reality (see the world cloud). What, in turn, does that mean for the practice of cross-disciplinary (multi- inter- trans) cooperation/integration which is so central for sustainability research? 2) Discussing the implications of such commitments in the framework of sustainability research. 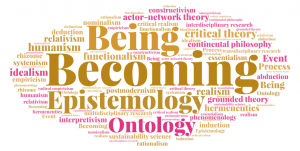 For this, Maria and Tilman developed a map that defines key ontological, epistemological and methodological positions, as well as truth criteria such as coherence, correspondence and pragmatic ones. 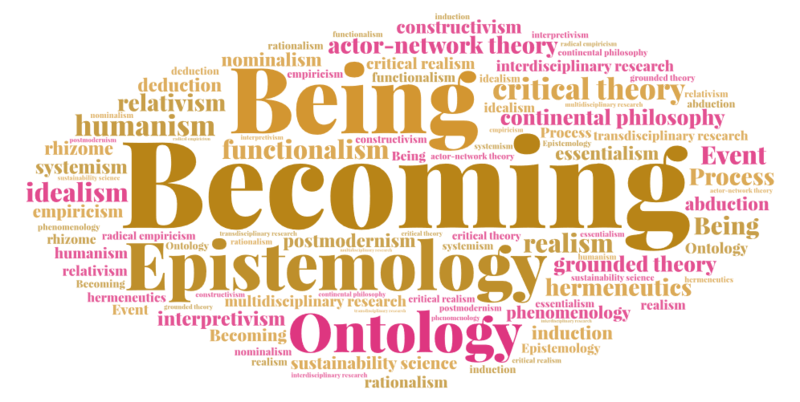 In a guided process the PhD students described their research, often beginning with concrete methods that they use on a daily basis, to then uncover underlying implicit ontological and epistemological commitments. The implications for multi- inter- or transdisciplinary practice in sustainability research were discussed accordingly. For instance, to what extent can critical realism support the integration of knowledge from a variety of methods – especially when based on different forms of reasoning such as deductive, abductive or inductive – as compared to “naive” realism or idealism? The positive feedback by the PhD students led the SES-Link team to consider developing this procedure in a more systematic way to be applied more thoroughly also beyond the SRC. ← In between: Bye bye Aquacross – welcome LimnoScenES!